Recently I have been part of a huge whatsapp chat with loads of other bloggers and we thought that it might be nice for us to do a mini series together over the next coming month! It will be four weeks long and each week there will be a given topic which we will all write a post on during that week on a day that suits us! The theme that we have decided on is the 'What's In My...' theme, this will run throughout the entire series and each week we will show you something different! 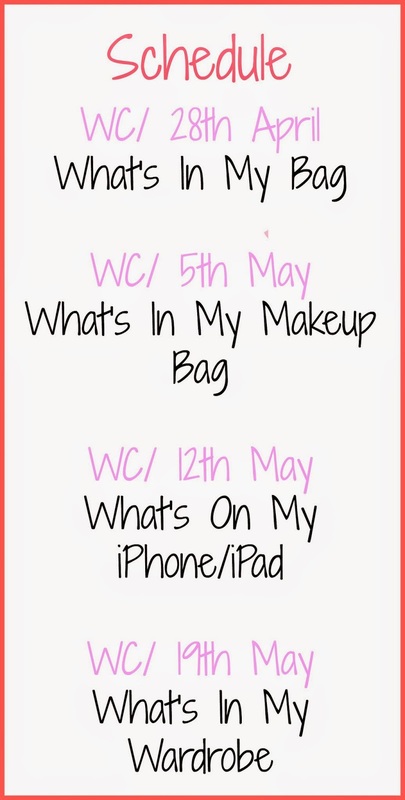 The four ideas that we chose are what's in my make-up bag, what's in my handbag, what's on my iphone/ipad and lastly what's in my wardrobe/room! So this is the schedule that we have come up with, there are no set days on which the posts are going to be published because we all have different personal schedules. Therefore just giving a week means that we can all stick to our own personal schedules and still post out own content! Not everyone's posts are going to be the same but they are all going to be brilliant none the less! I hope you all look forward to this as much as I am and that you go over and follow everyone that is participating! I will see you on Friday! Here’s how cervical cancer could potentially be prevented in the UK, if the age for tests was lowered. I’d love to hear your opinion on this topic so please take a look. You never know who this could affect, thank you.